north than the map below indicates. 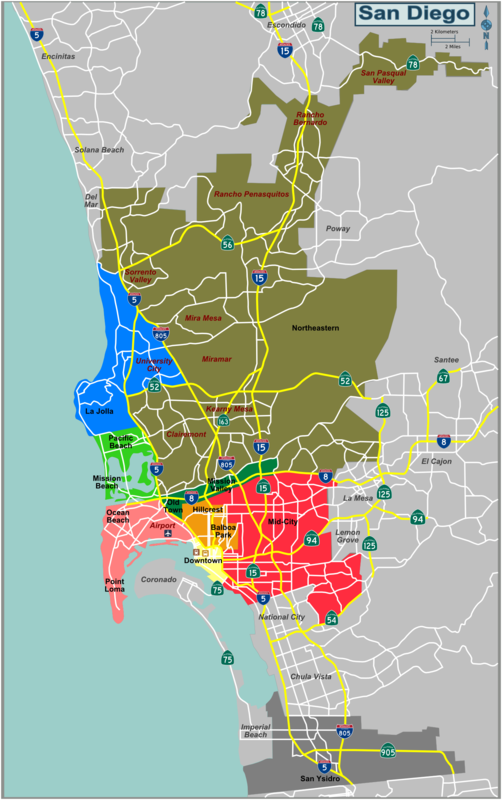 When San Diego, CA is broadly discussed, many assume that all cities and towns within San Diego County are part of the City of San Diego. That is not the case although many of the major attractions in areas adjacent to or reasonably close to San Diego. The following map to shows approximate district areas that are "assumed" by San Diego CA residents. The map further intends to help visitors, tourists and vacationers to the San Diego area plan hotel and lodging accommodations that will become a convenient home base in closest proximity to desired San Diego attractions and Things To Do in San Diego. Not only is downtown the central business district of the city, it is the hub of nightlife with a high concentration of restaurants, clubs and bars. Downtown area is home to historic "Gaslamp Quarter", "Little Italy", the San Diego Convention Center, PetCo Park, the "Embarcadero" and the Harbor Marina area on San Diego Bay. The shopping areas of "Seaport Village" and Horton Plaza are also located in the downtown area. This area is adjacent to downtown San Diego and is home to Balboa Park and its historic museums. It is also home to the San Diego Zoo which is on the grounds a Balboa Park. Hillcrest is a trendy urban neighborhood. Old Town San Diego and Mission Valley It is convenient to San Diego's "Hotel Circle" and home of Old Town San Diego which is considered the birthplace of San Diego. Old Town sits at the base of Presidio Park, the site of the Junipero Serra Museum. Mission Valley is a major commercial center that lies on the San Diego River. Mission Valley is where San Diego de Alcala, the first Spanish mission built in California, is located. Point Loma is on the tip of the peninsula across the San Diego Bay from downtown San Diego. The San Diego Airport is located in this area. The southern tip of Point Loma is Federal Land and includes the Old Point Loma Lighthouse, the Naval Base, Fort Rosecrans National Cemetery and the famous Cabrillo National Monument that marks the spot where Juan Cabrillo's Spanish Expedition landed in San Diego Bay in 1542. The west, southern end is a popular spot to watch the gray whales migrate in the ocean waters during the winter months. Just minutes from downtown San Diego, Mission Bay Park is a 4,600 acre aquatic playground of parks, beaches, marinas, hotels and 27 miles of shoreline. It is home to Seaworld and Belmont Amusement Park. Mission Beach and Pacific Beach are in this area featuring a 3-mile boardwalk, beach front shops, bars and restaurants. Although most visitors think La Jolla is a separate incorporated city, it is actually part of the City of San Diego. The most visited attraction in this area is the Village of La Jolla, an old Mediterranean style village on the coast with a wide variety of unique shops, museums, hotels and restaurants. La Jolla is home to Birch Aquarium, Scripps Institution of Oceanography, Scripps Park and several scenic beaches including La Jolla Shores, La Jolla Cove and Children's Pool. This area is primarily comprised of urban and suburban neighborhoods in the heights of eastern San Diego. There are no major attractions in this area. Like Mid-City, this area is primarily suburban San Diego residential area with a few scattered attractions. This is the southern-most part of San Diego and is the location of the busiest border-crossing into Mexico. The other side of the border is Tijuana, Mexico. NOTE: Coronado Island lies across the harbor from downtown San Diego and is closely aligned with The City of San Diego, but is a separate town and home to the historic Hotel del Coronado and the 10-mile long Strand Beach. The landmark Coronado Bridge connects Coronado to San Diego, California. See San Diego County Map for descriptions of other cities and towns within San Diego County where many major attractions are shared with vacationers to San Diego.